A company’s leadership team was frustrated by the “me first” behavior where knowledge sharing, collaboration, and going that extra mile were scarcely seen. Beyond fulfilling the assigned tasks, there was little energy and passion for the work. The immediate response was for supervisors to get tougher and demand more collaboration, commitment, and energy from the group. The truth is that these team members (and your team) are paid for their hands, arms, legs, brains, and eight to ten hours a day, but their hearts, ideas, commitment, passion, and creativity are things that must be volunteered. A leader can’t order or demand commitment. This is the point where real and lasting influence happens and authority is granted because of who the leader is as a person and his character, and not the power or position that is held. Here is an initial road map to follow to build a foundation of trust with those you lead. Please be aware there will be some heavy lifting and you’ll need your heart for this work more than your head. Humble yourself – Trust-building leadership must not have an “I am above you and I will show you the way” character. The foundation for trust is laid in the humble recognition that we share in this work together. This identity is often formed more by action than by words. Be willing to take on whatever the team may need even if what’s required might be perceived as beneath your title. When a difficult problem or situation arises, put your hands into the matter—not to meddle, but to help accomplish the goal. When a situation calls for “all hands on deck,” the leader’s hands are included. 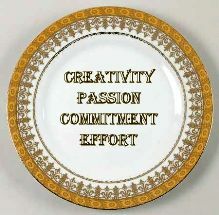 If you really want your team’s “fine china,” this is work that will become a core part of how you show up to lead every day. What’s the cost of this trust-building leadership?